Dr. Edmond Mgdesyan specializes in cosmetic dentistry, taking pride in offering the finest in patient care and services to each and every patient. He is determined to give you the smile you deserve! Dr. Mgdesyan knows that there are a variety of ways to maintain positive oral care and a beautiful smile, which guides his commitment in helping patients meet their needs. The procedures and treatments offered at our Calabasas office include porcelain veneers, dental implants, whitening, dental bonding and other dental procedures as well as Invisalign. We provide high standards of care, striving to make your visit with us comfortable, pleasant, and memorable. The entire staff of Dr. Mgdesyan shares his philosophy and commitment to provide you with excellence in cosmetic dentistry with the highest level of service. We build long-lasting dental relationships one smile at a time and we take great pride in helping you achieve your dream smile. 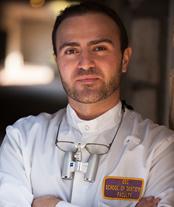 Dr Mgdesyan is a graduate of USC School of Dentistry with honors and was one of two students who were offered a teaching position immediately after graduating in 2005. In 2010 Dr. Mgdesyan was awarded a 5 year outstanding part-time faculty recognition by USC. He is currently teaching Restorative Sciences part time at USC and is very passionate about his work.